Perspective, Perspective, Perspective. As you can guess I really like the perspective of this photo. 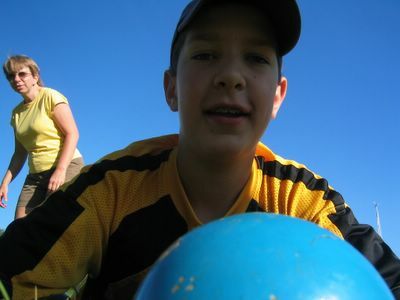 In the photograph, I set the camera in the grass next to a Bocce Ball, and guessed If I had the angle correct. I was lucky enough to have Judy walking by while the photo was being taken.